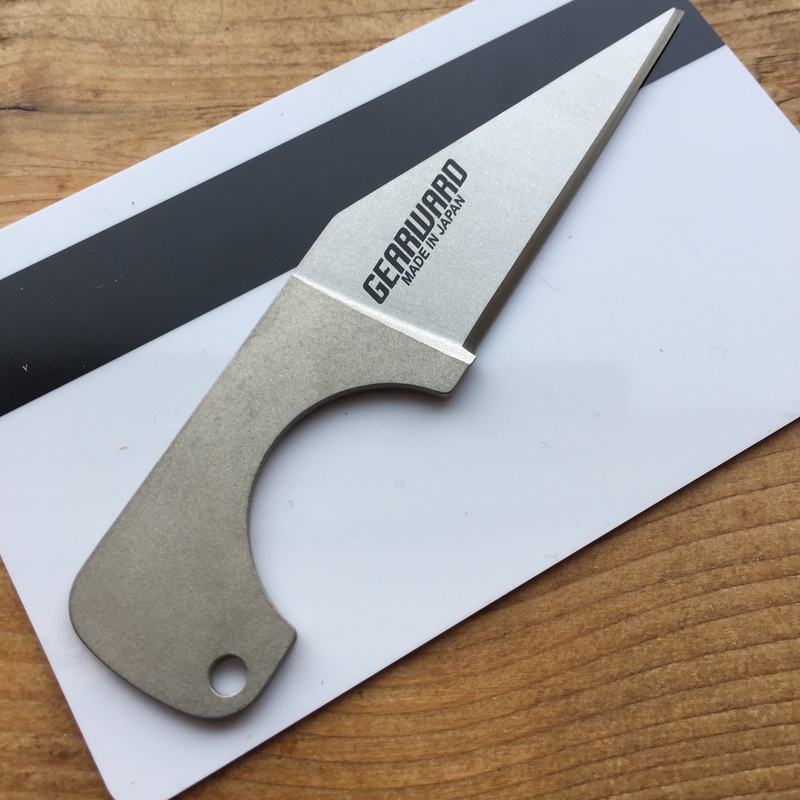 Gearward’s HemiSERE Titanium Lapel Knife is a throwback to the OSS Lapel Knife… at least in terms of function and intended use. It is thoroughly modern in material, a titanium-ceramic composite, which makes it feather light and gives it aggressive cutting properties. 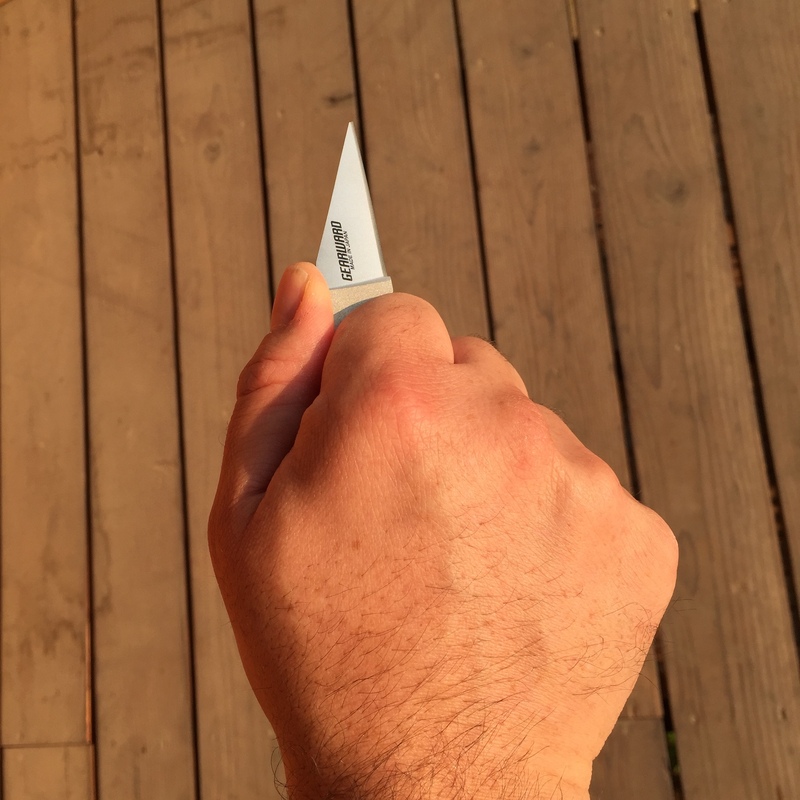 This knife is designed to be immanently concealable. Its size and the materials chosen for its construction are in keeping with that design goal. The HemiSERE is a diminutive 3.375″ in overall length. It is ground from 0.05″ thick non-ferrous titanium/ceramic composite material that is most commonly found in high end kitchen knives. That small size, wafer-thinness, and material mean that this little knife weighs in at just 4 grams. 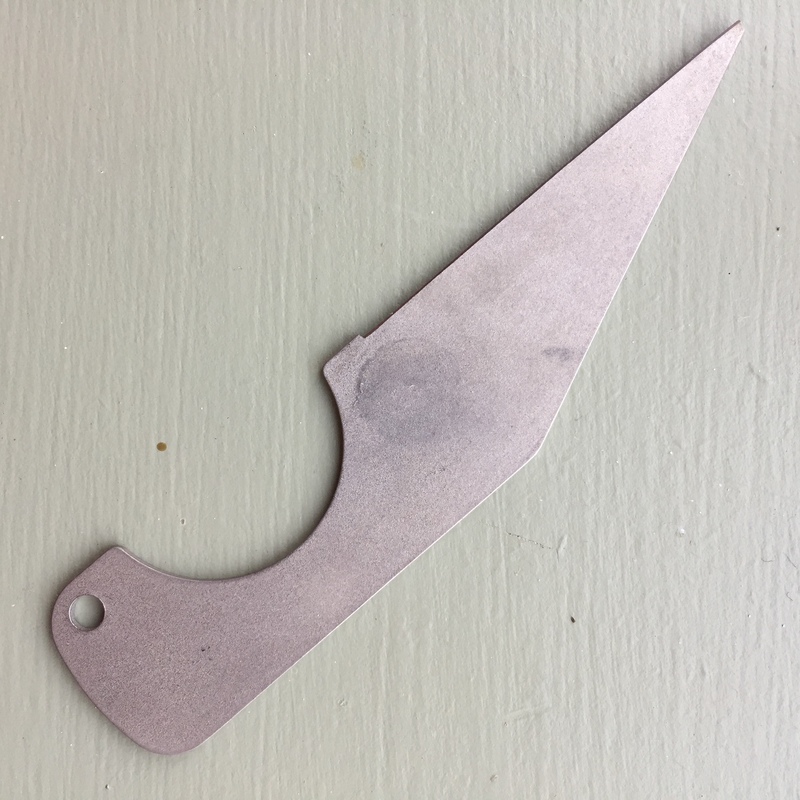 The wharncliffe blade shape is chisel ground. It has a full height flat primary grind with a secondary bevel on only one side. The tip is very slightly ground off, sort of like a micro reverse tanto, to render a still very acute but slightly stronger tip. It ships already stuck to dummy credit card and with 12 3M Glue Dots. I’ll start first by saying this knife is VERY small and that means that the handle design has to be on point or it just won’t work. Fortunately, Gearward did their homework. The handle has a bead blast finish and a deeply dished choil that locks the knife into the users hand. Without the choil, this knife would probably be nearly impossible to use and retain. Handle design is exceedingly important on knives this small and thin. The HemiSERE is so light and concealable that it can be stuck just about anywhere with the included (and easily replaceable) Glue Dots. Gearward shows the HemiSERE stuck, without a sheath, under the collar of a shirt which caused a bit of an uproar when the knife was announced here on JTT. I tested this and found that it actually seems safer than you might think with a stiff collared dress shirt and the edge turned down but I likely would not carry it that way. This knife was designed by a world traveler for world travelers… and I don’t mean Sandals resort. If you are already the type of person who is taking risks with the places you travel, under collar carry might make more sense. The carry methods are only limited by your imagination. It can be stuck inside a phone case, inside your wallet, on a credit card (replace the dummy with a real card that you don’t use anymore), in an out of the way place inside a bag or briefcase, inside an Altoids tin, or anywhere else you can safely carry a razor sharp knife. Your carry options could be expanded if you fashion some kind of a small sheath for it. My favorite way to carry it is on the back of a credit card though that might not be the most accessible in an emergency. There are a number of thoughtful touches in this knife, many of which I think are unique to the HemiSERE. I have already mentioned the well designed handle and bead-blasted finish that promotes grip. The material itself is interesting. The titanium/ceramic composite is extremely lightweight. It cuts better than titanium alone and is more durable than ceramic alone while retaining the non-ferrous, lightweight properties of both which are desirable for a knife like this. Gearward grinds the tip off very slightly. It still penetrates quite well but the needle like point that would likely break off anyway is gone. Finally, the choice of a wharncliffe blade shape puts the point forward and gives plenty of straight cutting edge to lever through cuts. Speaking of cuts, this is an aggressive cutter… I mean very aggressive. It cuts like a paring knife! It is wafer thin which helps and comes sharp with a somewhat toothy edge. It bites deeply into soft materials, slicing cleanly thanks to the full height flat grind. Sharpening is a little tricky but not impossible – definitely easier than sharpening all ceramic blades. I would like to see Gearward make a small, non-metallic sheath available for this knife. I would pay extra for some kind of minimalist blade cover just to have some expanded carry options. Gearward went all in on concealment with this knife and it shows. It is purpose built. The design, the material, even the philosophy of use baked in with the included credit card and glue dots speak to the extent to which this knife is to be concealed. This knife is meant to disappear and it does so readily.